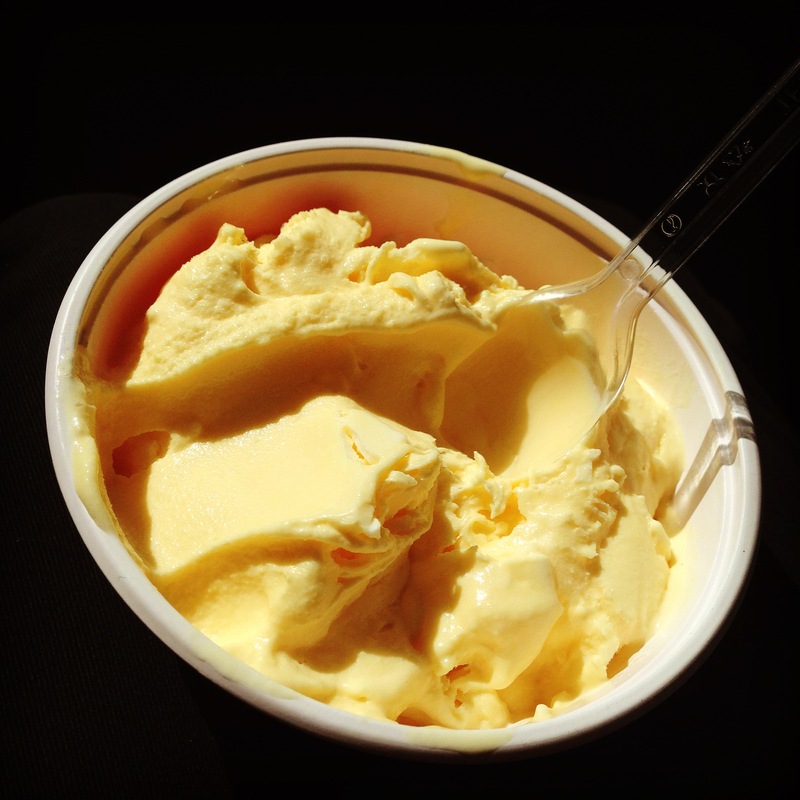 Photo: a cup of saffron ice cream on Heaven Street, Tehran. In Tehran I went to House of the Artists, in the center of a beautiful sculpture garden in the middle of the city. There was an elegant restaurant where I ordered a latté served in a tulip glass. Later I wandered up and down the stairs, in and out of photography exhibits, in and out of an art opening, where the painter seemed to be explaining his work to fawning students; then up to a cinema where there seemed to be a grand film premiere, with the director posing for smartphone pics. I didn’t understand anything except by context, ambiance, and body language. But I was just manically, wordlessly happy, and had the very intense feeling that I needed to come back—to the House of the Artists, to Tehran, to Iran itself—because I have important things to learn here. Something about austerity and longing. Something about restraint and decadence. Something only a very ancient culture could teach me. And then I think of bell hooks’s essay. I fear it explains my motivations completely. Am I just eating the Other, sampling cultures a la carte, unable to enact any social dynamic other than consumption? I want to argue with hooks and say, “Doesn’t everyone have their own agency?” And of course they do have full agency, but from within different spheres of privilege. Or I might say, “Am I not just as willing to be eaten as eat?” But again, of course that doesn’t mean the same thing, coming from me. I belong to the white American capitalist hegemony. There’s no risk of loss; except the continued constant one, of whites’ own humanity diminished by other races’ dehumanization. The way travel feels to me is not that I’m eating a culture, but that I’m remembering it. Like segments of my genome are lighting up, or my cells are remembering other phases of being, the atoms themselves remembering all the paths they’ve taken before they became a part of my body, and maybe seeing all the paths they’ll take in the future. I am a racist person, as we all are; products of a racist society. I crave absolution from bell hooks, of course, and permission to travel and seek contact with people different from me. But it’s not my place to ask that, and not her—or anyone else’s—place to give. So I have only my own counsel, and that of the individuals I meet. I hope it means something, at least, to understand the landscape. That it will help me to cause least harm in my travels, and even some good. I’m vividly aware of this in Iran, especially, a country that’s been so long estranged from my own. That is a possibility I am trying to realize. 1) We could approach our actions from the point of view that Western hegemony won’t last forever. How does our relationship with other cultures change if we imagine America becoming like Spain, or Western Europe + America becoming like South America? You could also construe this from the perspective of a diminished or fallen empire, such as the UK compared to its 19th century glory or Greece compared to the time of Athens and Sparta. Putting an expiration date on hegemony strikes me as increasingly realistic in light of trends like the shrinking size of the white majority in the US and the increasing economic power of China. 2) We can understand traditionally Western traditions like democracy and capitalism as lacking some fixed essence. To be a “consumer” of other cultures, then, does not have to have a single, uniquely Western meaning. As other cultures take on, react to, and transform democracy or capitalism, they can teach us about the limitations of our own understanding of things like happiness, justice, or the common good. Our obligation in this context would be to give the criticisms and experiences of other cultures a higher order of attention and weight, precisely because Westerners stand in a position of relative institutional power and forced this interaction on the rest of the world for our own interests. 3) Option 2 construes the special ethical obligations that follow from being in a position of institutional power in historically Western terms. (More precisely, it frames the responses of other cultures to our traditions as “experiments” in living that we have a special responsibility to learn from.) A different alternative is to try to understand what those ethical obligations would be for someone in the actual culture that you’re engaging with. How would Iranians see the benefits or harm of your visit? If they understand it as good for them, does it matter what it means to you? Perhaps our concern about being a consumer of Others can become a negative way of imposing the same Western hegemony as before by foreclosing the possibility of difference in meaning. Wow this was great and I agree, well put! It sounds like you think a lot about how you affect the world around you. I guess we all have a tendency to think we can take what we want, when we want it, and forget how it would feel the other way around. I may have to read the essay aswell! I loved how u wrote about the way travel feels to you. .. and the mention of going and taking from a culture I guess is something I do and never really thought about it. Good piece. I was fortunate to do a lot of overseas traveling as a teenager, and really struggled with the feeling that just by being an outsider in a place I was fouling it up a little. It is a beautiful thing to find familiarity in a different way of life than your own, but I noticed that no matter how careful I was of local customs, I still managed to offend some – if not by my own actions, then by how they were re-told to others. People see what they expect to see, and many will see a traveler as disrespectful to other cultures. I was able to reconcile this feeling by noticing the other reaction that people have when you visit their culture, which is to be amazed at your interest in their everyday life. I tried to show how I appreciated things that maybe were considered not special by locals, and to spread the message that where I was from had a lot of problems too (a hard sell in some places!). Good to bear in mind the negative, I think, to always try to minimize it. As a Hispanic I have always loved Chinese food. It’s interesting stopping to think about your behaviors. I bet this is awesome! You have given me much to reflect on, Ms. Byrne. Thank you. Thanks for this beautiful thought provoking share. When I travel I don’t want to ‘consume’ either. Beautiful words. It made my desire to travel even bigger. In my opinion, we are indeed a product of a racial system, but we are not defined by it: we have the choice to have new experiences and overcome our instincts, discover that we were wrong but in order to build different and better ideas. Loved your words! Thai you for sharing! I always find food and eating to be a significant part of my travel experiences … it is great to have some ‘food for thought’ from you – thank you! Marvellous! I really love your blog!! Pls visit us, we are Spanish girls that are working on a school projet!! Thank u so much! Very beautifully written! This is not a way I have thought of things before but I have recently been thinking of my travels to Europe and how the places that weren’t tourist traps were the best part. While I am familiar with Bell Hooks, I have yet the pleasure to read this essay and will be sure to do so after reading this blog post. I also enjoyed that this post violated my expectations of what it was about after reading the title and seeing the picture. So this is both fortuitous and incredibly incisive. Loved this! I am definitely intrigued to go read this book now as well. To travel is to consume. The two are synonymous.